Butterball, like any self-respecting multi-million-dollar, category-leading brand, would have you believe its turkeys are, well, the only turkeys. The truth is, there are all manner of ways these days to get your white-meat, dark-meat, and tryptophan fix. Here, a guide to all things Meleagris gallopavo. By far the best-selling turkeys in the U.S. are the mass-produced, factory-farmed birds—Butterball, etc.—sold in supermarkets. Almost exclusively broad-breasted whites—a breed that’s also referred to as “large white” because of the size of its breast—these birds are typically raised in factory conditions, sometimes thousands to a barn, and may be treated with growth hormones to enhance their size and antibiotics to prevent disease. The birds tend to be raised quickly, in about twelve weeks, which yields a large and inexpensive supply but doesn’t allow the birds’ flavor to develop fully. Many factory-farmed birds are injected during processing with a solution that might contain water, stock, butter, or other seasonings to make the bird plumper, and more flavorful. That process produces a large bird that cooks up moist and tender, but it can also produce off-flavors and a mushy texture. Factory-farmed birds range in size anywhere from 8 to 28 pounds (one pound per person is a good serving guideline) and tend to be inexpensive—$1.50 or so per pound. In keeping with the general artisanalization of all things edible, Heritage turkeys have grown increasingly popular. Breeds such as American Bronzes and Bourbon Reds are the direct descendants of the first domesticated gobblers found in America. They had become all but extinct until four years ago, when a company called Heritage Foods USA started marketing the birds (they’re raised by local farmers). Heritage turkeys are allowed to roam freely in pastures and forage for food naturally. They aren’t treated with growth hormones or antibiotics, and they don’t contain additives. They’re typically allowed to grow for 26 to 28 weeks and reach sizes of twenty pounds. Heritage turkeys aren’t as plump as broad-breasted whites, but their meat has a deeper, more intense flavor and a firmer texture. Because they’re more costly to produce, Heritage birds are more expensive than broad-breasted whites, from $7 to $10 per pound. Quality-obsessed foodies like Dan Barber, chef-owner of Blue Hill at Stone Barns, and Tom Biggs of Four Corners Farm in Vermont, who supplies many of the city’s top chefs, have recently begun offering “pastured” turkeys. Broad-breasted whites raised in the style of Heritage turkeys, the birds are allowed to roam freely in pastures, they eat only natural foods, and they’re not treated with growth hormones, antibiotics, or additives. Like Heritage turkeys, pastured birds take longer to raise than factory-farmed broad-breasted whites, are smaller than their mass-produced cousins, and have a richer flavor and firmer texture. Pastured birds, like Heritage turkeys, also cost more than mass-produced supermarket birds, from $3.50 to $4.50 per pound. “Organic,” under USDA regulations, denotes a turkey that has been proved free of antibiotics, growth hormones, pesticides, and certain other unnatural substances and processing techniques; organic birds must also be fed certified organic food and be free to range and eat outdoors. D’Artagnan, the well-known specialty meat distributors, sell organic turkeys such as Nicholas broad-breasted whites. They’re generally moist and juicy, and their flavor is milder than that of Heritage birds (they cost about $7 per pound). Wild turkeys are not, strictly speaking, wild (in effect, any birds sold commercially—as in not shot—must be commercially processed), but they’re as close as you’ll get (without toting your own shotgun into the woods) to eating what the pilgrims ate. Raised on farms, wild turkeys are comparatively small (usually no more than fifteen pounds), with less white meat than other turkeys and chewy, almost gamy dark meat. Because there’s very little fat on wild birds, they can be dry if they’re not cooked carefully or brined. Wild birds cost about $5.50 per pound. When buying a turkey, it’s helpful to know what certain terms mean. Birds that contain extra water, broth, butter, or other additives must be labeled “basted” or “self-basting,” according to USDA regulations. “Fresh” turkeys are birds that have never been cooled below 26 degrees Fahrenheit (that’s below the freezing temperature of water, but not cold enough to meet the USDA’s standard of frozen). “Frozen” turkeys must then be stored at or below zero degrees. “Natural” means the product contains no artificial ingredients or added color and is minimally processed. “Minimally processed” means the raw product has not been fundamentally altered. “Free-range” indicates that the animals have access to the outdoors (but doesn’t necessarily mean the product is organic). “No antibiotics” means just that (but only that). It’s hard to tell much about the quality of a given frozen turkey, since the bird is wrapped in plastic. That said, look for a bird with the latest sell-by date, avoid packaging that’s leaking or sticky, and don’t buy a bird if it has even a slightly off odor. Always buy a fresh turkey from a reputable producer or butcher. 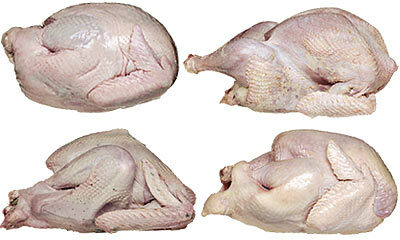 Look for a plump breast, moist pinkish-white skin with no blemishes or bruises, and be sure the bird has no off aromas. Toms tend to be larger, but there’s no difference in flavor between toms and hens. Butterball and other factory-farmed turkeys are available at local supermarkets. Heritage turkeys are sold at Fairway and Gourmet Garage stores (various locations; fifteen to eighteen pounds for about $130) or online at heritagefoodsusa.com (fifteen to eighteen pounds, $160). Dan Barber’s pastured turkeys can be purchased at stonebarnscenter.org or by calling 914-366-6200 ($3.50 per pound). 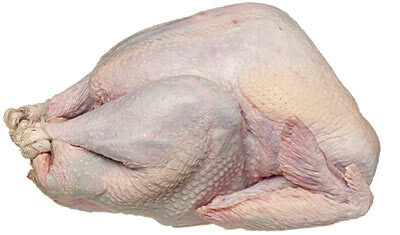 Four Corners Farm turkeys can be ordered through Oppenheimer Meats ($4.59 per pound; 212-662-0246). USDA-certified organic broad-breasted white turkeys are available from D’Artagnan at Garden of Eden and Food Emporium or online at dartagnan.com (10 to 22 pounds, from $65.75 to $125). Wild turkeys are available from Quattro’s Game Farm in Union Square Greenmarket ($5.59 per pound) or from Ottomanelli & Sons (five to seven pounds, $42; 212-675-4217).